Salinity stress is known for adverse effect on plants. Priming with salicylic acid was able to improve plant performance under salinity stress. This study aimed to determine the effect of priming duration with salicylic acid on growth, leaf anatomy and the optimal priming duration for sweet corn seedlings (Zea mays L.) under salinity stress. The experiment was based on Completely Randomized Design with two factors and five replications. The first factor was priming duration with salicylic acid (2 mM) with four different durations (0, 12, 18 and 24 h). The second factor was the level of salinity (NaCl 0% and 3%). Parameters observed were germination percentage, plant height, root length, fresh weight, dry weight, chlorophyll content, leaf proline content, leaf anatomy and stomatal density. Data were analyzed with t-test, ANOVA and followed by Duncan’s test at 95% confidence level. 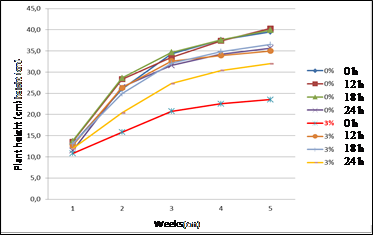 The results showed that 18-h priming duration observed as the highest germination percentage which was 7% higher than control. Priming for 24 h showed phytotoxic effect for sweet corn on the germination phase by reducing the percentage of germination. The application of salicylic acid mitigated the toxic effects of NaCl stress on maize seedlings and considerably improved root and shoot growth, photosynthetic pigments, fresh weight, dry weight, proline content, and stomatal density, as well as could maintaining the leaf anatomy. The optimal priming duration with salicylic acid for sweet corn seedlings under 3 % salinity was 18 h.
Arif, M., Jan, M.T., Khan, N.U., Khan, A., Khan, M.J., Munir, I. 2010. Effect of seed priming on growth parameters of soybean. Pakistan Journal of Botany, 42(2), pp. 2803-2812. Harborne, J.B. 1998. Phytochemical Methods: A Guide to Modern Techniques of Plant Analysis 3rd Edition. Chapman & Hall. London. pp. 227-229. Pangaribuan, N. 2001. Hardening dalam Upaya Mengatasi Efek Toksik pada Tanaman Bayam (Amaranthus sp.). Jurnal Matematika, Sains dan Teknologi, (1), pp. 25-29. Sudaryanto, T., Kustiari, R., Saliem, H.P. 2010. Analisis Sumber Daya Lahan Menuju Ketahanan Pangan Berkelanjutan. BPP Pertanian. Jakarta. pp.1-23.